So far, so good? Well don’t quit now, there are still more great services that will help improve your Gmail productivity ahead. Here is the other half of the post. A simple extension for Chrome that makes Gmail your default email application. It also adds an icon to your browser so that you can easily share links via email. A no button version is also available if you don’t need the send email icon. A cool task manager that works with Gmail, Google Calendar, Twitter, Outlook and a range of mobile devices. 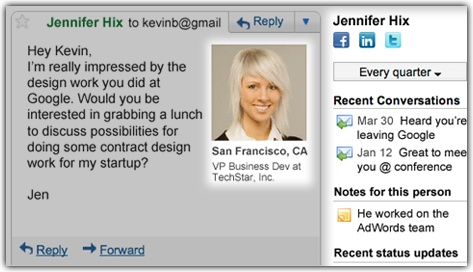 You can connect tasks to emails, contacts and Google Calendar and add tasks for starred items. When you update a task in the Gmail app it is instantly updated on the main website and on your mobile device. A Google Labs version is also available. A multi-platform application that builds an interactive contact book using your Gmail, Facebook, LinkedIn and Twitter contact information. Once you have created an account and connected your social media profiles, it will search through all your accounts and all of your emails and build profiles for everyone you have contacted. Building your contact book can take 5-10 minutes, or a little longer if you have used a lot of your Gmail storage allocation. It’s worthwhile though. Once it has created the contact book you can easily search through contacts and see your relationship history, your recent emails and your friends in common. An address book clean up tool that removes duplicates and similar contacts and allows you to merge contacts. Conflicting email addresses and phone numbers for contacts can be resolved and you can backup your address book too. A free account allows you 250 contacts and an unlimited number of scrubs. You can pay a one time fee of $9.95 to clean up your address book if you exceed this amount or $24.95 per year if you need to clean it up on a regular basis. A personal assistant that organises your emails by removing clutter. 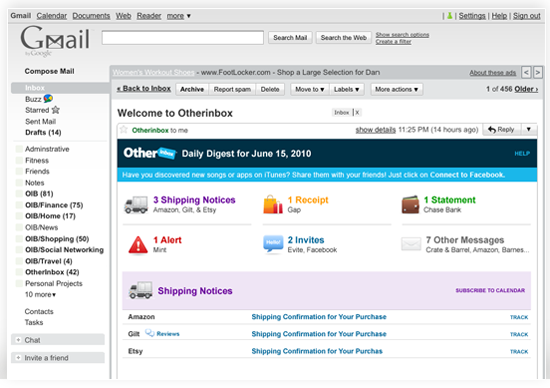 It scans your inbox for commercial messages and social network updates that you do want to read at some point but don’t want them cluttering up your inbox. 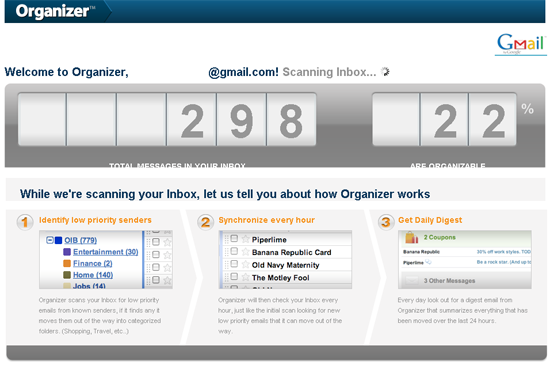 Organizer checks your emails every hour and splits emails into high and low priority. Low priority emails can be delivered to you in a daily digest so that they can all be read easily at once. A cool Google Chrome extension that allows you to read, search and respond to your email. The design is based on Gmails tablet interface so is very user friendly. It’s a good app for anyone who loses their internet connection frequently. 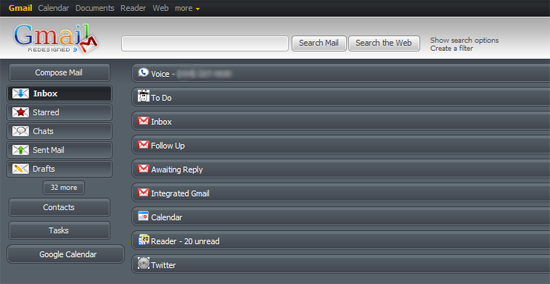 A Firefox extension that changes Gmail to show Gmail, Google Calendar, Google Reader and Google Labs all on the one page. 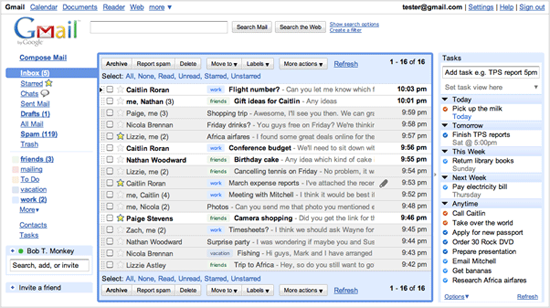 Perfect for Gmail users who view their newsreader a lot or organise things via Google Calendar. 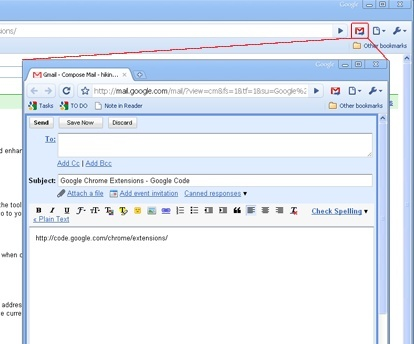 Create a virtual drive of your Gmail account so that you can copy and retrieve files directly through Internet Explorer. If you add a new file to your Gmail drive, the script creates and email and posts it to your account. With over 7GB of free storage, Gmail is a useful way of storing files online via your operating system. A great app that really should be integrated into Gmail itself. The extension allows you to save file attachments directly into your Google Docs account, making it much easier to find your important files. A profile extension that works in a similar way to Rapportive. The app shows a profile picture and job title for each of your contacts together with links to their social media profiles, recent emails and notes. You can also set reminders for yourself to email someone if you haven’t spoke to them in a while. A stand alone application that lets you access Gmail, Google Calendar, Google Docs, Google Maps, Google Reader and Picasa Web Albums. It works pretty much like a browser and has all the features you would expect from accessing the services online. Although it hasn’t been updated since early 2009, it still works perfectly. A fantastic attachment extension for Google Chrome that lets you manage your attachments with ease. When you search Gmail, attachments will be shown at the top of the page above other search results (in thumbnail format). 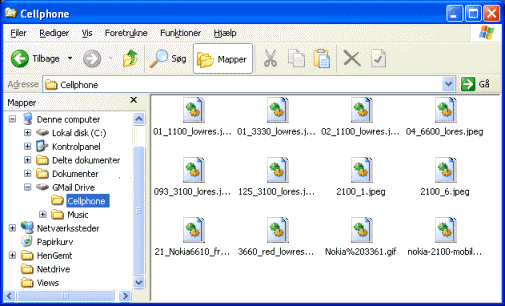 This makes it easier to find your images and other attachments. 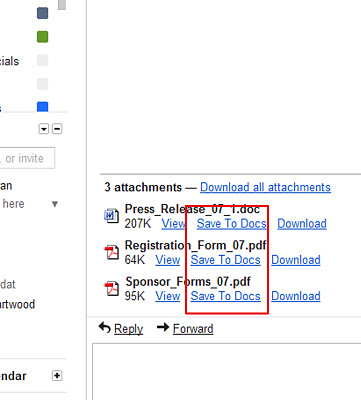 Attachments can also be uploaded directly to your Dropbox account without even leaving Gmail. 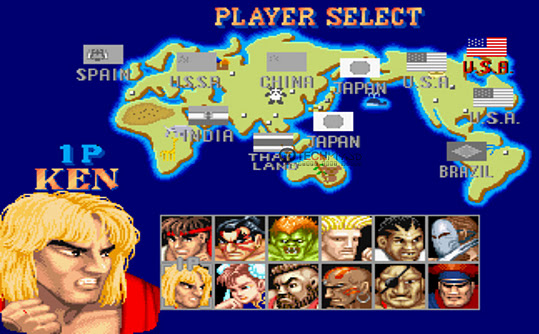 Last but certainly not least is arguably the greatest Gmail application ever made, the Street Fighter II checker is essentially the same as the regular mail checker with the exception of every email received being notified by a sound from the classic Street Fighter II video game. Once installed, you will hear the classic ‘Hadouken’ fireball sound whenever you receive one email and the ‘Shoryuken’ dragon punch sound when you receive 2 or more emails at the same time. It never gets old! 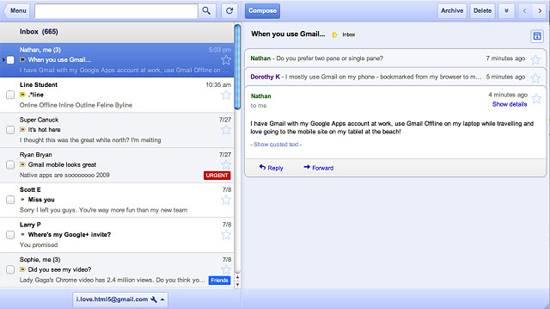 Gmail is a great service on it’s own however many of these tools make the service even better. People who use Gmail for business spend a lot of time in their Gmail account therefore integrating advanced address books, task managers and other tools makes sense. Be warned though that some tools don’t work great together. For example, the Smartr Inbox and Remember The Milk apps clash because they both try and update the right hand side of the Gmail page. Browser extensions are very easy to enable and disable though so it’s easy to resolve any issue like this. What’s your favourite Gmail tool? Let us know in the comment section.